One of the easiest ways to show someone you care at Christmas is to make a delicious baked treat. Perhaps you have a specialty you make each year? Or, maybe you are of the Pillsbury persuasion? Either way sweet treats are a sweet way to show your appreciation! Every year our local fire department drives through our neighborhood with Santa on a bright red fire engine, sirens blaring. Santa sits up high and waves to the kids below while the fire fighters walk alongside of the truck. Each fire fighter walks the length of our driveway to wish our kids Merry Christmas and presents them with a candy cane. It’s a small token of their generosity, but my kids look forward to it every year. Besides running into a burning building to save lives (voluntarily) our local smoke jumpers do a lot to prepare the kids in our town for a fire emergency. They dedicate a lot of time to educating kids on fire safety and showing off their gear. This makes seeing a fire fighter less scary if ever faced with one in full turn out gear during a fire emergency. They try to prepare our young kids how to stay safe. It is such a valuable service many of them provide for free. Home made cookies for our local police officers and fire fighters. Everyone loves to get some love and appreciation from the community they serve. So bake up a few dozen of your favorite cookies! Call ahead to your local fire station or police station and ask when a good time to make a delivery is. You want to be sure you aren’t interrupting a scheduled training and that someone is there to accept your donation. Have the kids make some thank you cards and let them deliver in person with you. Dropping off a tray of cookies is an easy way to say thanks, and a casual way to introduce your kids to important community helpers. he Whatever Mom is a full time wife and twin mama living on coffee and wine. She enjoys the pure rush of cleaning the BIG potty between loads of laundry. It is her dream that moms everywhere accept and embrace the Whatever Mom philosophy which can be found here. My dad was a volunteer fire fighter for many years. I grew up in and out of the station. My heart goes out to the fighters and the families who have to wait for them to come home! Baking cookies for our firefighters ad police officers is on my list of giving ideas! It is a simple way to show our thanks! It really is. Often we get a fun tour of the trucks and the station. We take a few pics with the fire fighters too. My kids love it! How very thoughtful! Such a great idea and it is a good thing for the kids to do! Thanks for the reminder to show appreciation for people who serve in our communities. It is easy to remember to thank the people we see every day but there are plenty of people who dont get the thumbs up they deserve. bravo. cheers. Supporting those in service industries is a great way to spend time leading up to Christmas. Even if they are paid, the hours and type of work are quite demanding beyond what they receive. OK, hahaha, first I love that you used the phrase “pillsbury persuasion” – that’s hilarious! and second, I love that you show your gratitude to those who keep us safe and protected. What a wonderful reminder 🙂 thank you! We do this for our job! I love recognizing our service men and women that keep us safe everyday! It’s nice your family does this! That is a really good idea. I love making Christmas cookies and always deliver them to neighbors and friends. Yours look so good. This is such a brilliant idea! I hear so many people talk about how much they appreciate those who serve their community but taking action and SHOWING them is a great idea. What a great idea to let our fire fighters feel they are loved. Everyone of us should do this. My dad was a volunteer fire fighter when I was young. I spent a lot of time at the fire station and seeing first hand how these men and women operate. My dad passed 11 years ago, so I feel like I’m doing a little something special in his memory. Love that you did this! Sharing is caring. And great family and community way to show support to the emergency responders! This is such a lovely thought! We were at a christmas tree lighting tonight, and the local fire brigade brought Santa and Mrs Claus along in their truck – my kids were awestruck 🙂 I always make cookies for neighbours, but never thought to do it for the local departments. What a fantastic idea! I bet they were so thrilled to receive them! I love that you are teaching your kids young! This is a great activity for kids to teach them to be thankful and respect those people helping others (hopefully others, anyway!). I agree it is important to share and show community spirit. Love the idea of cookies to share with those who work hard to keep our community intact. such a sweet idea! Christmas cookies are the best! We live on a base and love giving Christmas cookies to the base guards! 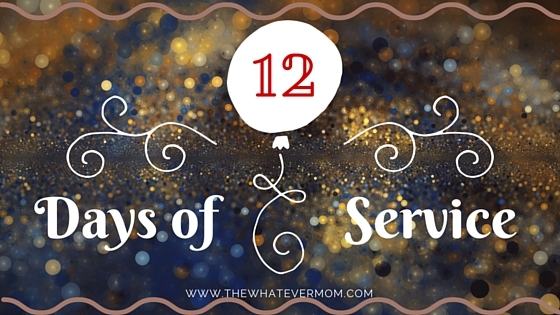 Hi Whatever Mom…Loved this series of 12 Days of Service. We did a handful of them with our 5 and 3 year old. The first one was this one and we dropped cookies off at the local state police barracks. It was a great experience. Thanks for all the ideas! Thank you so much for following along!! Wishing you and your family a great 2016!! Hi Whatever Mom – Thanks for these ideas. We did a few of them with our 5 and 3 year old and as a family we loved it. This was the first one we started with by visiting our local state trooper barracks. It was great for the kids to see their giving in action. That’s awesome! I hope your kids enjoyed the experience!! Thank you for taking the time to share!